Hurray! I wasn’t sure I’d have time to make a second set of harem pants after the first set turned out wimpy and ill-fitting and incredibly satin. BUT I DID! They’re still based off the pants in the Simplicity 5359 pattern set, but I increased the width of each leg to a full 60″ of fabric (the original pattern only called for about 40″ for each leg) and increased the pattern length by 1″ to 43″ long. I would have increased it more, but I knew I’d be losing the encased elastic channels at the ankles in favor of gathering with my sewing machines pleating foot and binding the raw edge with left over bias tape from my jacket. I hate the feel of elasticed ankles. I also discovered (through my first satin pair of harem pants) that these pants fit better backwards than they did frontwards. Very strange, but since I was planning to move the zipper from the back to the front ANYWAY, that meant one less pattern change to hold in my head. Huzzah! I was a little worried about wrangling the bulk of all this fabric into the waistband and ankle bands, but a quick run through with my trusty pleating foot too the fabric down to a manageable level. Then I ironed and ran two lines of basting stitches over the pleats and gathered it all into the waistband. 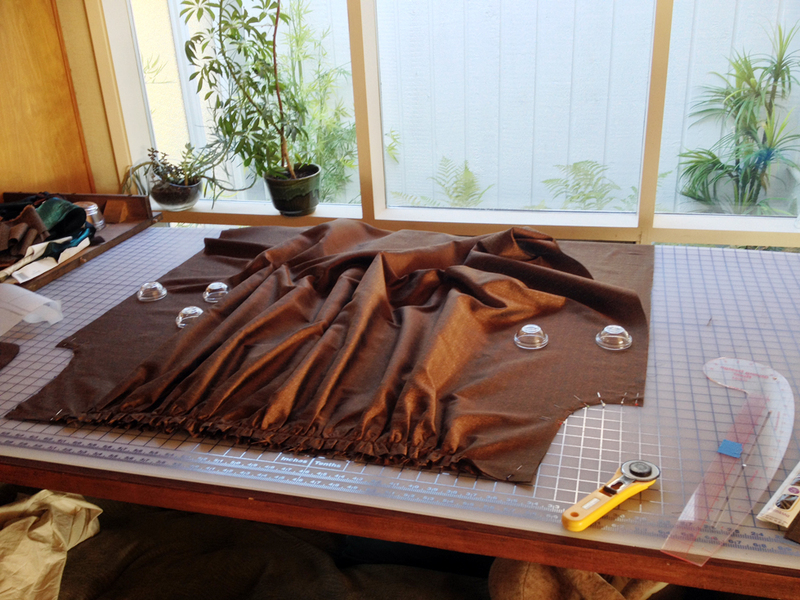 All pleated up and ready to be assembled. I meant to update sooner, but I was so scared of my deadline (less than two weeks from idea to convention) that I just got started working right away and haven’t had time to write up any posts. 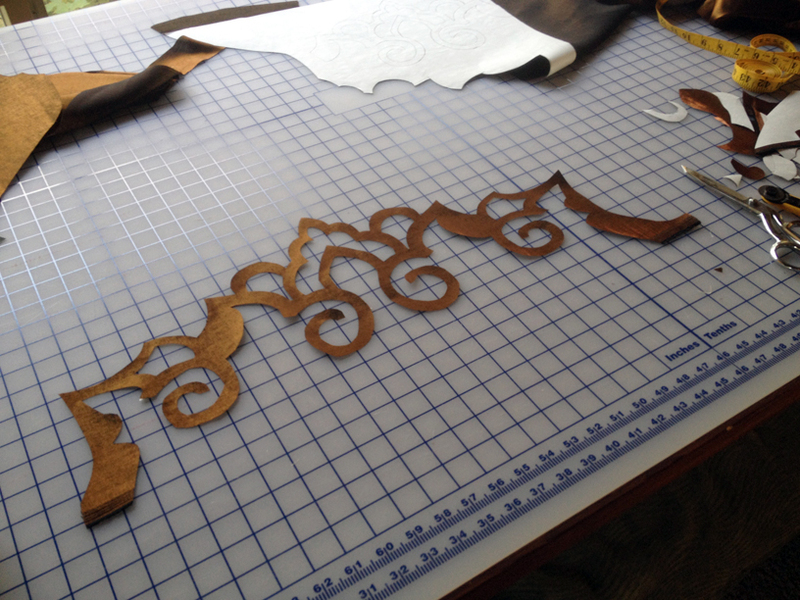 I was also under a very tight deadline, so I had to make due with altering pre-existing patterns. No fancy-pants drafting or muslin alterations for me this time around! I figure if anyone asks for the origin of my costume I’ll just say my hot air balloon lands where it lands, and I have no idea which countries I’ve traveled to. 😉 That’s my story and I’m stickin’ to it! 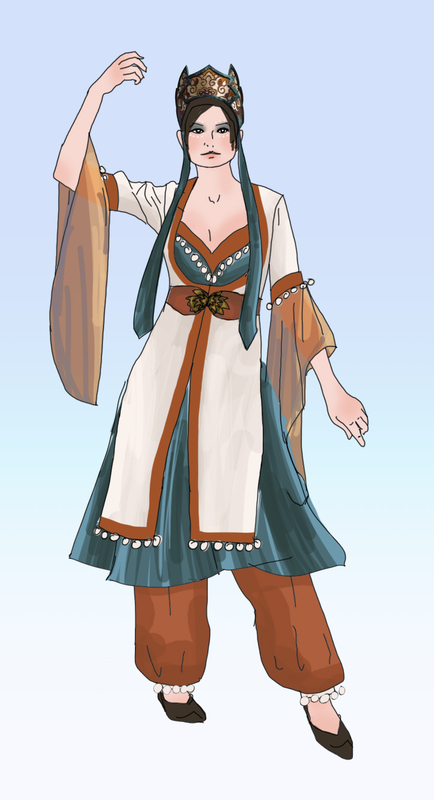 At the time I drew up my concept, I thought this pattern included some sort of top/bra/bodice like what was shown in the sleeve art, but SURPRISE! that was a separate pattern (Simplicity 2158 for those interested.) And in the end I really didn’t want to pay for a third pattern (did you know Joann wont apply any coupons to their patterns? I did not realize until this project. Hrmph.) 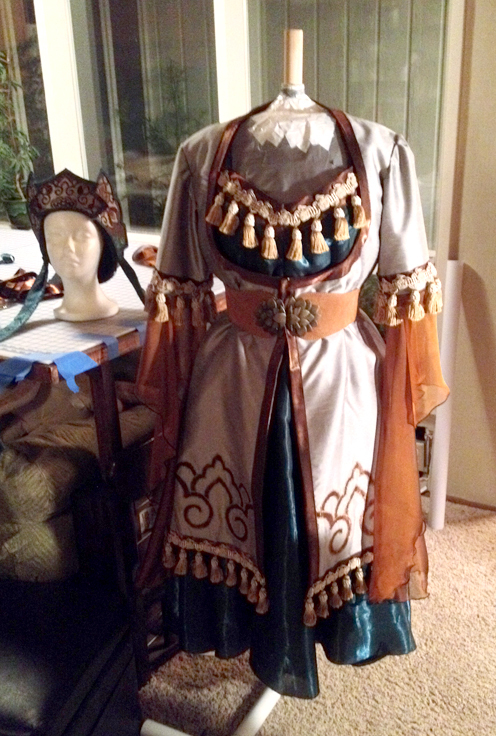 So, I ended up cobbling together my own bodice pattern for this costume. So much for not wanting to draft anything myself this time around, pfft! A little note to myself in the future if I ever re-use this plan: 8 yards of fabric is WAY more fabric than this skirt requires, especially if it’s all done in one fabric rather than two as the pattern specifies. I probably could have managed with 4 or 5 yards with fabric to spare. Now I have a ton of teal fabric I don’t know what to do with. At first I worried I might have to make this pattern’s little corset/waist cincher too, but I realized I had an elastic belt in my closet that matched my plan perfectly, so I drew that in instead. I’ve had a lot of accessory luck with this costume so far. 🙂 I have a pair of black and gold Jutti I bought at the same time as my hat that I’m trying to break in before Steamcon, and I’ve got some brassy jewelry that will go well with this costume, too. 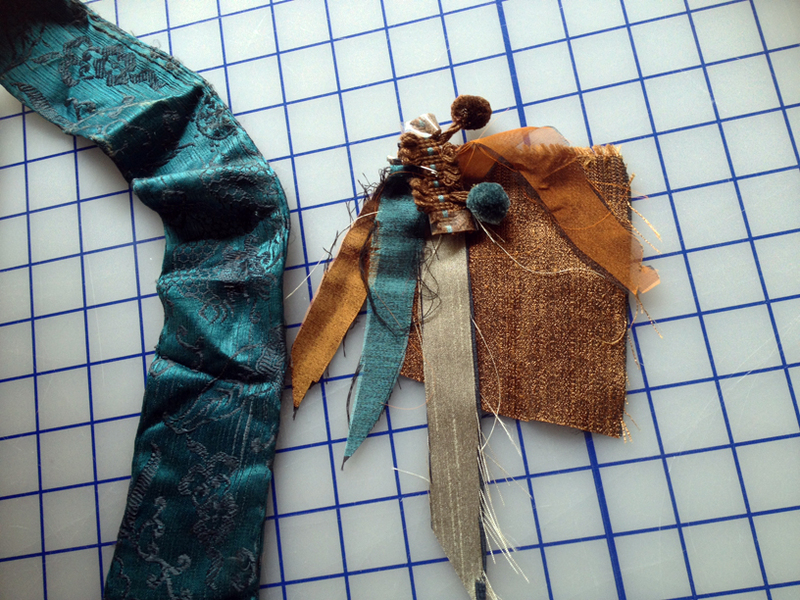 From left to right, the patterned teal is my existing hat fabric I was trying to match. The brown “Copper Shimmer Satin” would be for the jacket bias binding, the jacket lining, and the harem pants (though I would later regret this decision.) The teal satin (“Shimmer Satin” again) would make up the bodice and skirt, and the silver fake dupioni would make up the main body of the jacket. The pompoms were my first pass idea for the trim, the brown rougher woven fabric was a runner up for the harem pants, and the beautiful copper silk chiffon would make up the sleeves. At first I was so excited to find that blue and brown pompom trim, but after drawing up my concept I realized that everywhere I wanted to use the trim it would be backed with either teal or brown fabric, making it practically invisible. Not good. I ended up going back to Pacific Fabrics a few days later to find a different trim that would have a higher contrast against my fabrics. A) White/gray. I thought this would be the winner as it was the closest to the white pompoms in my original concept, but in person they just looked SO bright and artificial. They were also the “messiest” in terms of tassel drape. C) White/brown. I really liked this one in the store as I thought it got me the white of my original drawing while not being so artificial looking as Option A. Unfortunately, there wasn’t enough left on the bolt for my purposes (there was only about 40″ left) so if I were to use it I’d have to remove about half of the trim I was planning on using. And that was after I’d already edited out the trim around the ankles. Bummer. So, what to do when you don’t know what to do? Go home and think it over. That night when I looked back over the photos I’d taken, I realized that Option B was my favorite, both in terms of how it looked in real life and how it photographed, but I still couldn’t get over the price. 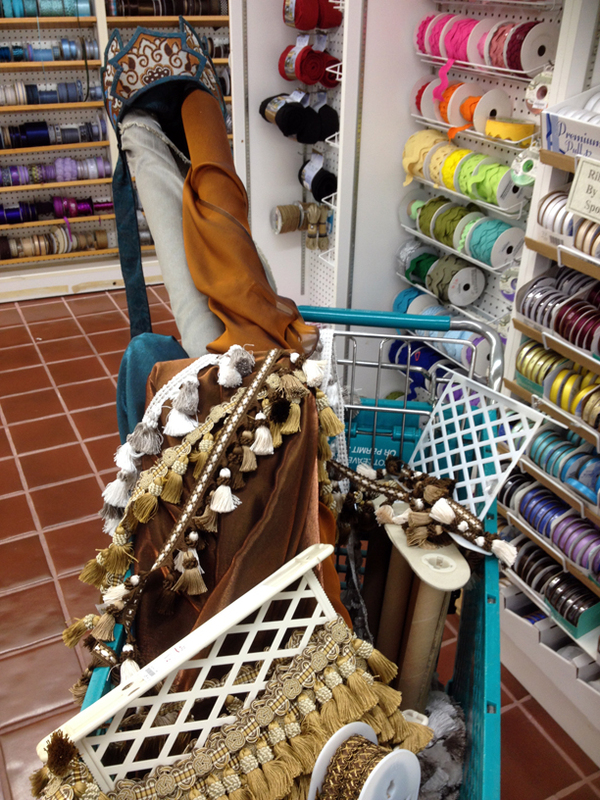 And then I checked my email and saw that Pacific Fabrics was having a 40% off Columbus Day sale the next day. Hurray! That trim was coming home with me, me me ME! I think this costume is charmed, I’m usually never this lucky. 🙂 Maybe the sale helps to make up for all the extra fabric I ended up accidentally over-buying for this project. 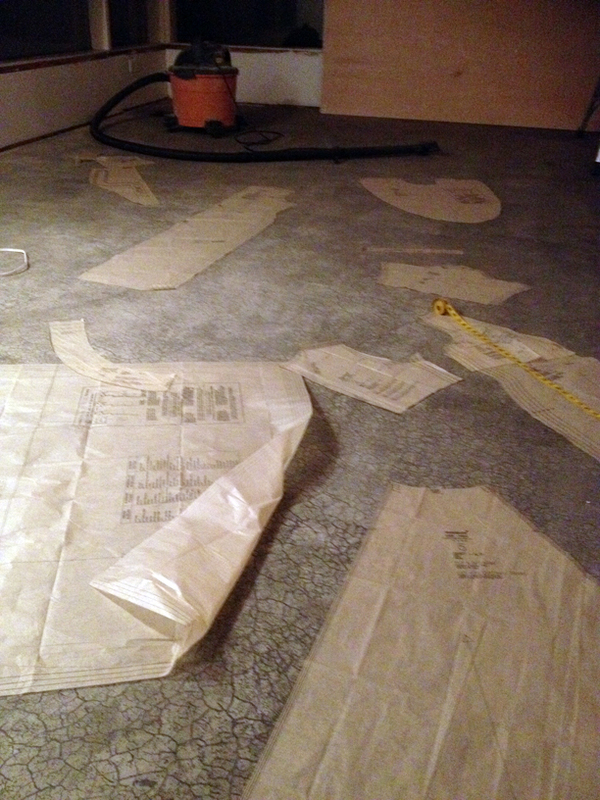 The best part about sewing in a construction zone? Lots of room to lay out pattern pieces. 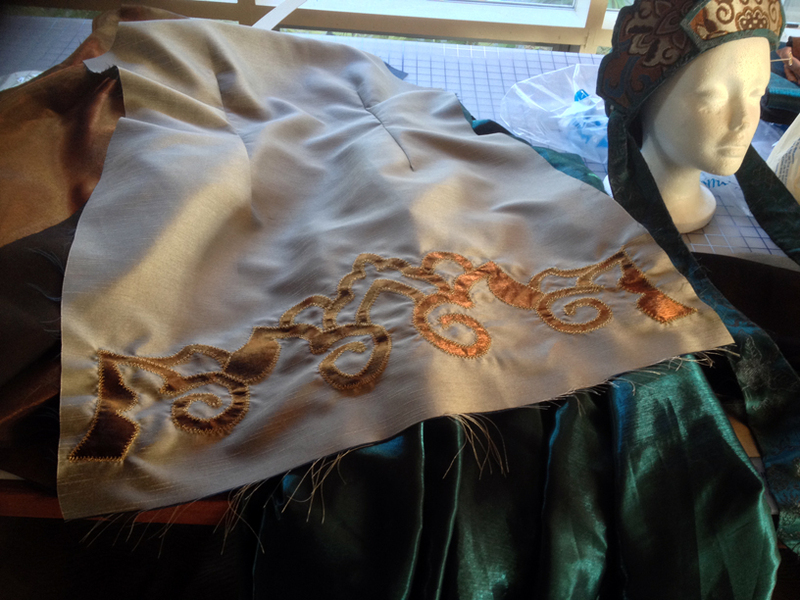 After the first 3 or 4 days, I had the teal under dress and harem pants (made of the copper shimmer satin) about 90% done. It was at this point I realized I looked like a giant satin monster, and so there are no photos. I was making good time though, and I resolved to move on and work on the jacket with the plan that if I had a day or two left by the time the jacket was completed, I would return to the satin harem pants and re-make them in the rougher material at the end of the project. On to the jacket! I really wanted to incorporate some of the swirl motifs from the hat into the jacket, so I decided it was time to bust out the Heat’n’Bond and do some appliqué. 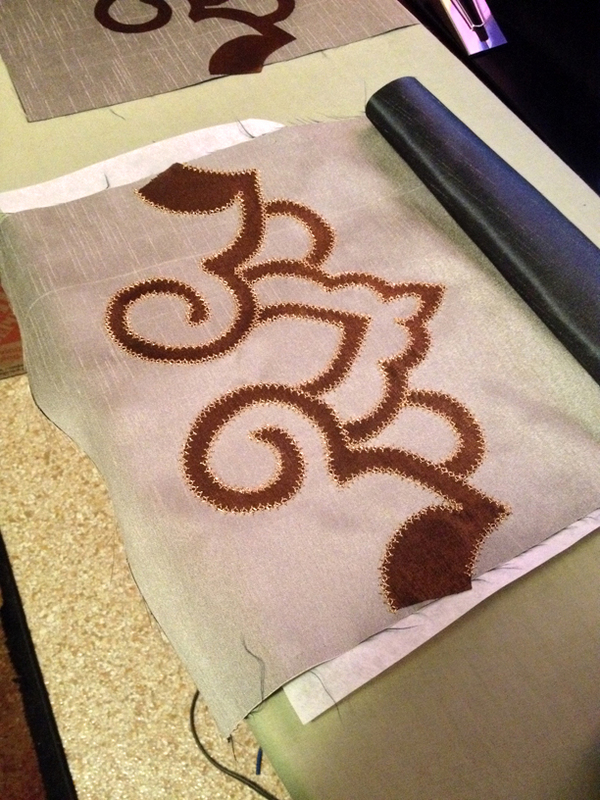 Then it’s just a matter of topstitching over the pattern with decorative thread, and you’re done! Um. Well. Sorta. That’s how it was SUPPOSED to go anyway. In reality, after I followed all of those steps I got a great big pucker-fest. Needless to say, I was not pleased. The puckers wouldn’t iron out. Good thing I did the back piece first. No time to re-do, so hopefully nobody will notice. And if they do notice, I’ll already be walking away. Ha! You can also see the gold thread stitching detail I used to hold down the applique in this photo. It reminds me of a Mandelbrot Set. At some point during the last week (my memory is getting a bit fuzzy) my buddy Jean came over to help me make yards and yards of bias tape and a big ole’ fluffy braid hair extension to hide the fact that my hair doesn’t touch my shoulders. She was a very welcome guest, and I think she contributed mightily to me not burning out halfway through last week. Of course, this distraction also means I completely forgot to take any photos, and then also haven’t documented any additional progress up until now. So, with the magic of the internet, let’s just fast forward to last night’s progress! I hope I’m not jinxing myself (since technically I still want to make that second pair of harem pants and you never know what could happen between then and now,) but I think this may be the first convention I’ve made a costume for where I haven’t been sewing right up until the morning of.